A lot of images conjured up in my mind even before we got to Bonifacio High Street Central. It was my daughter's 15th birthday and we got lucky to be seated inside right even before it poured. We barely noticed the heavy rain inside as we were comfortably seated at the end center, near the kitchen counter. Taken aback with all the unusual restaurant's decor, I try to assimilate the images of a tavern as I have seen it in the movies or on novels. I'm sure the thought of a tavern may remind you of Ye Olde English type of place from Shakespearean or a drinking place where cowboys hang out and brawl. 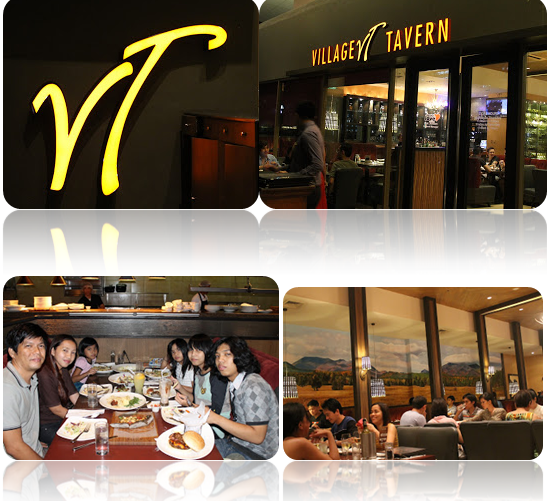 I'm talking about the only tavern I know or have stepped into, the Village Tavern, in their only branch at The Fort. At first, my husband had certain apprehensions about the place. Maybe having the same idea about taverns and bars. Seeing many people having rounds of drinks on their tables, he thought there wouldn't be food to delight our hungry tums. Upon seeing the lights hanged on the ceiling, he said, "Are you sure about this place? We can go to the neighboring restaurant for a Filipino fusion cuisine." The light bulbs were attached to clumped up deers' antlers. I found it rather amusing. Moving towards the table we were led to, we saw sophisticated furnitures, leather finished chairs, red wooden tables and a painted wall- an impression of an Old American country side. I forgot to mention the bar on the left once you enter, which added to the bad thought my husband had with Village Tavern, of it not being a family eating joint. Still, I stood firm to my choice, as it was backed up with blogs from Yedylicious.com and Yaniconquistadora.blogspot.com. I'm sure the dinner would be just as awesome as these bloggers have had it. The staff was courteous and we didn't wait that long for our seats even though they are full. They were able to find us the a good spot. We started with the two's favorite bevs, root beer float for Kuya Darren and lemonade for Ate Danielle. Danie, our birthday girl a.k.a. the Lemon King, as what the other girls would call her never failed to order a glass of it. Hmmm, how come she doesn't drink the ones I do at home? Though it was my first time to see the menu as well (I didn't check for it online), it was easy to choose what to order and with the waitstaff being kind to suggest their specialties. To boost our appetite, we had these crunchy Homemade Jalapeno Poppers. Layers of spice and different textures, from crunchy to chewy then back to spicy. Good thing it was served with a bunch of greens and the water (infused with lemon slices) kept on washing it. Next to it is a huge bowl of Thai Chicken Salad. Another recommendation from the staff, which was really light yet filling, had to say cause I ate half the serving of it. If you want a different take on your salad, some crunch perhaps without the carrots. Aside from the crisp and fresh greens from the cabbage and iceberg lettuce. Easily enjoyable with roasted chicken slices and friend wontons. Tossed up on lime-cilantro dressing and drizzled with traditional Thai peanut sauce is my perfect salad. With edamame, it is a piece of heaven's garden right at my salad. Now tell me, was there an instance when the whole family ate outside without a pizza? None! So I had to challenge Village Tavern and all of us with this new pizza on our list, the Black Pizza. Village Tavern’s pizzas are made entirely from scratch as you can see from the picture. The Black Pizza uses hand-pulled squid ink dough with thyme and rosemary herbs all over it, making it very Italian. The dough was very savory and aromatic and toppings of three kinds cheeses, pepperoni, mushrooms and bell peppers made this an instant favorite. Chicken Marsala for Daddy. The chicken meat were breaded and fried then smothered with Lombardo Marsala wine sauce, mixed with mushrooms, prosciutto and served with garlic mashed potatoes and stir-fried French haricot beans. If you have been a constant visitor of our blog, you might have bumped in to this post were I mentioned my kids fixation to pasta with white or cream sauce - Tips on Dining Out with Kids + Claw Daddy's + Rufo's. Well, here is something worth telling you. They didn't have Carbonara or Alfredo but they do have Grilled Chicken Penne. It's a cream sauce but with basils. Hmm...So I've thought really hard, can basil and cream sauce work together? My kids never mind having fresh basils on our tomato sauces but on cream sauce, nah! But we didn't have a choice, else the kids wouldn't be eating and I don't want to go to KFC. But what a blessing, they did like it. Though we grown ups had the Grilled Chicken which were at the top of the pasta, the kids enjoyed the crispy pancetta bits and caramelized onions. One serving which was supposed to fit one adult was cut in to two for the little girls, and guess what they finished it all and asked for more. One great thing was that we were able to order half from the regular serving. Lastly, according to blogs I have read, their gourmet burgers are must-tries. So my Kuya Darren had ordered Cowboy Burger. On the menu says: All burgers and sandwiches are served on artisan bread and your choice of French fries with sea salt, potato salad or mango coleslaw. And might I say, I had to compliment them for the gourgeous bun they have for this burger. However, his burger patty was over-grilled. You can actually see all the sides charred even the bacon, which was Applewood-smoked bacon. We are familiar with Maple smoked bacon so there was a bit unidentified taste on the bacon. Also with burger are cheddar cheese and caramelized onions, all made more flavorful with barbecue sauce. Everything looks yummy hihi! Meg loves pasta, I hope they'll branch out so we can try it. Yeah I agree with you! One of these days, I am going to try that black pizza.